I made a post like this around 11 months ago a week or so before the Tony Awards aired, but this year I thought I'd do it on the day the nominations were announced. The Tony's excite me possibly even more than the Olivier's do and I was beyond excited to see some fantastic performances I've read about and watched clips of myself be nominated for awards this year. I can't help but feel like many shows got snubbed though including absolutely no mention of shows like Side Show, It Shoulda Been You, Honeymoon in Vegas, Finding Neverland and more, as well as only one nomination for the recent Broadway revival of Gigi starring Vanessa Hudgens. Regardless, here are what I predict will come out on the night of the Tony's (June 7th); where 'Curious Incident' is mentioned, I am of course referring to The Curious Incident of the Dog in the Night-Time. Finally, if you don't yet know all of the possible nominees then you can familiarise yourself with the full list I'm referencing from, here. Best Musical to Something Rotten! Best Leading Actor in a Musical to Brian d'Arcy James for Something Rotten! Best Featured Actor in a Musical to Christian Borle for Something Rotten! Best Score to Wayne Kirkpatrick and Karey Kirkpatrick for Something Rotten! I'd just like to point out that these are my predictions through and through and that I'd probably pick some different options if I had my choice but this is a good blend of what I'd like to see win and what I think will win because that seems to be what the Tony voters lean towards (but even choosing what you want to win is incredibly difficult in this strong and stellar Broadway season). 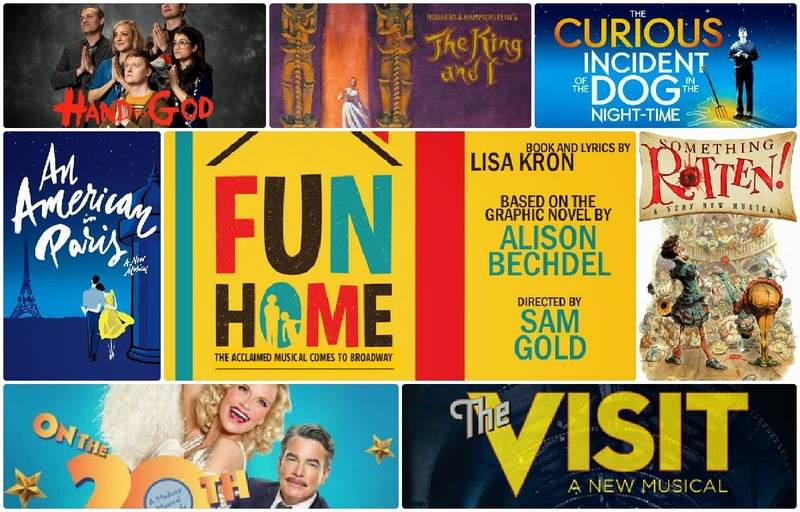 You can keep up with all the Tony buzz over on @smusicalmusings on Twitter and I'll be live tweeting the Tony winners through the night of June 7th/early hours of June 8th over there, too!